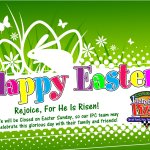 Closed for Easter - Incredible Pizza Company - Enjoy our huge all-you-can-eat buffet, indoor Go-Kart Races, Bumper Cars, Route 66 Mini Golf, a huge video game arcade with prizes, Bowling, and more! In honor of the Easter holiday, we will be closed on Sun., April 21. We hope our guests and employees will spend time with family and friends on the special day. We will re-open on Mon., April 22 at 11 a.m.